Posing for a photo with their friend Martha Sharpe, Class of 1883, seated at right, they are anything but typical Vassar students of the time. 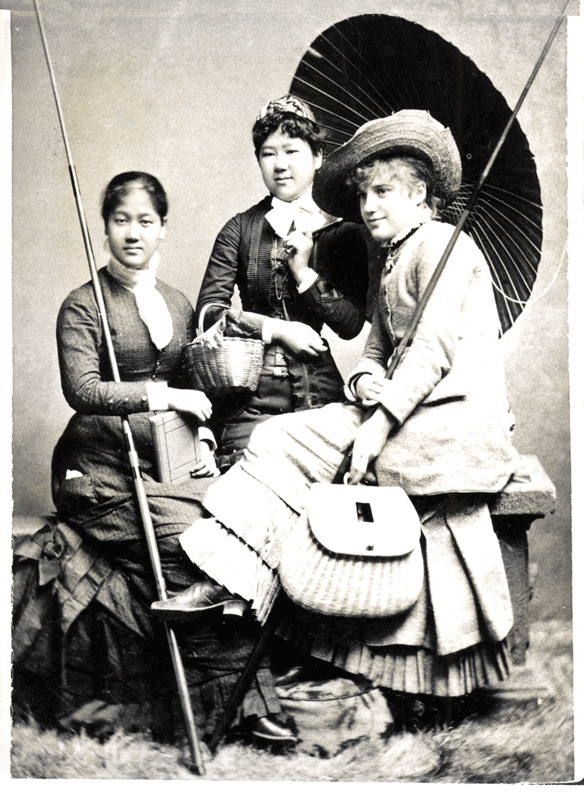 The young woman sitting straight-backed at left is Sutematsu Yamakawa, famed in the college’s history as Princess Oyama, Class of 1882, the first Japanese woman ever to achieve a college degree (and, by all available evidence, the first student of color known to have graduated from Vassar). Holding the parasol is a less familiar figure, her compatriot Shige Nagai, who actually completed her studies at Vassar a year earlier, earning a certificate from the School of Music, which was then considered a separate entity from the college. While Princess Oyama has regularly been invoked as an icon of both Vassar and Japanese history, the extraordinary backstory that brought Yamakawa and Nagai to their college years in Poughkeepsie—and their lives afterward—is lesser known. The recent publication of Janice P. Nimura’s book Daughters of the Samurai (W.W. Norton & Company) may change that. Remarkably, the two were among the first five Japanese girls ever to be sent abroad by a new, reform-minded government. They arrived in the United States in early 1872, when Yamakawa was 11 and Nagai was 10. Neither of the five girls, who had to traverse not only the Pacific Ocean but also the transcontinental U.S., spoke a word of English, nor were they given an English-speaking chaperone. Remarkably, within less than seven years they would be sufficiently “Americanized” to qualify for Vassar, where they both thrived. “British Policy toward Japan,” condemning the unequal trade agreement that persisted between the two nations. The speech was “the most interesting of the whole series,” declared the Poughkeepsie Eagle, “an eloquent plea for the independent nationality of Japan.” The Chicago Tribune called it “the most notable, as it was the most enthusiastically applauded oration of the day.” Sutematsu had proved herself as canny as she was eloquent: without directly criticizing her adopted country, whose policies toward Japan were similarly patronizing, she had made her point nonetheless. And then—in a sequel as amazing as the story of their journey to Vassar—the young women were sent back to a home country that seemed as alien to them as America had a decade before. Japan was a nation unprepared for college-educated women. All of this and much more—the sociopolitical earthquake of the Meiji Restoration that forever changed the lives of the Japanese people, the racism aimed at African Americans and Chinese immigrants in the United States in the 1870s and 1880s, how the lives of American women seemed a breath of fresh air compared to the lives of women in Japan, despite the sexism that existed on these shores—is related in Nimura’s book, with an eye for the telling detail. Such is our ongoing fascination with royalty that Sutematsu Yamakawa is remembered today as much for her title as for her pioneering role in graduating from Vassar. But as Nimura’s book amply demonstrates, Yamakawa and Shige Nagai lived lives far richer than that. What was it like for Sutematsu Yamakawa Oyama and Shige Nagai Uriu in Vassar's early days? Read an excerpt from Daughters of the Samaurai: A Journey from East to West and Back. Might the friendship between Yamakawa, Nagai, and Martha Sharpe, all pictured, have led to the creation of the Jade Parlour in Main Building? This article probes the questions.